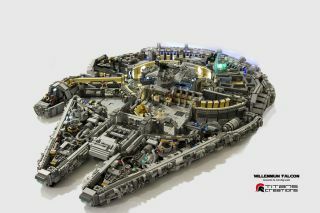 Singapore-based Lego-building team Titans Creations made this incredibly detailed version of the Millennium Falcon spaceship from "Star Wars" for Legoland Malaysia's "May the 4th" event in 2015. A team of LEGO builders has created a Millennium Falcon model whose complexity and attention to detail will make your jaw drop. The Singapore-based team, called Titans Creations, spent two months planning and building the model for LEGOLand Malaysia's May the 4th "Star Wars" event. The LEGO version of Han Solo's spaceship measures 43.3 inches by 33.5 inches (110 by 85 centimeters) and contains so many bricks that the team lost count, Titans Creations members wrote on their Facebook page. "Main objective of this build is to replicate the interior of the popular Millennium Falcon as accurate[ly] as possible with references to different online material," they added on a Flickr page featuring images of the LEGO spaceship. "Features 24 LED, 7 [of] which are programmed to pulsate at the rear thruster for realism, and the rest spread amomg the corridor, hyperdrive and cockpit." Han Solo and Chewbacca at the controls of Titans Creations' Lego Millennium Falcon. Han Solo and Chewbacca sit at the controls of the LEGO Millennium Falcon, and Princess Leia, Luke Skywalker, C3PO, R2D2 and other passengers are onboard as well. Close-up of part of Titans Creations' intricate Lego version of the Millennium Falcon. These "Star Wars" characters, and the richly detailed interior, are visible because Titans Creations' LEGO Millennium Falcon lacks a roof. So Han probably isn't going to take the spaceship on a run through an asteroid field anytime soon.